It’s always a common practice to pour concrete or rather place a concrete over an existing concrete. Several situations really call upon the need to exercise this including the rehabilitation of roadways, the house walls and even along the bridges. It’s therefore important to come up with the best criterion that will ensure that the practice is done professionally and the goal is achieved. You need to have clear specifications of the procedures to be followed to ensure that the placing and the bonding of the two concrete are achieved. 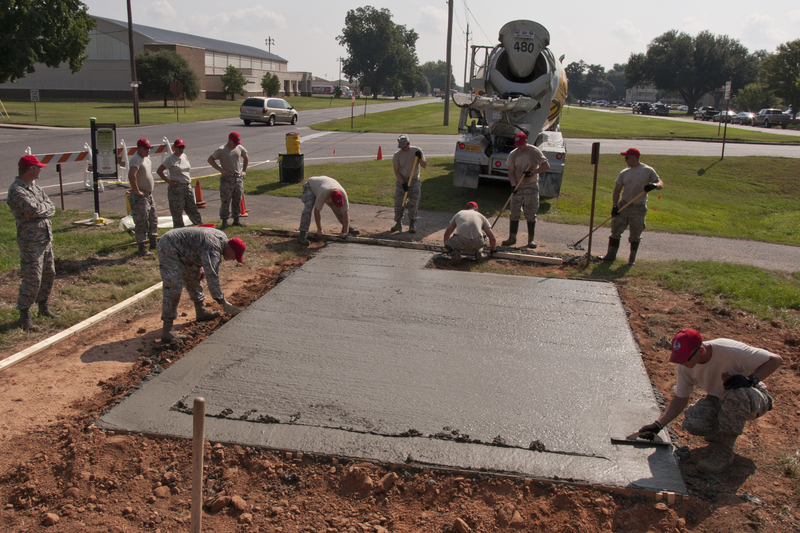 Before we delve into the article, a gentle reminder that we handle all types of concrete services including (but not limited to) concrete driveway repair in Killeen. Cleaning here entails practices such as the efficient scrubbing of the flaked surfaces. You will be required to remove any surface that is palled. A loose concrete will not actually work well with the new concrete, it’s, therefore, necessary to dislodge any form of this loose surface and dispose of them well to ensure that what is left in a pure and sound concrete. You must then clean that surface to ensure that no loose entity is left in the old concrete. All this is meant to make the resurfacing efficient and effective. Creating forms in an old concrete can be achieved by making small undulations on the upper surface of the sound concrete left after cleaning. You may have to take out some thickness of this surface around 5 cm thickness. They are actually the trenches that will serve well to bond the new concrete into the old concrete during the resurfacing. Form flushes will be staked in the sides of the concrete slabs and also at the joints of every form. Every crack that preexisted in the original concrete must be taken care of by using the bond breakers to ensure that the initial crack is not propagated to the next concrete! The forms will then be required to be coated with a vegetable oil then a thin layer of the bonding adhesive will be added. It should actually be placed two inches at the bottom of the slab. It can be wet-table or non-wet table adhesive. Non-wet table adhesive has proven to be the best in both the modification of the new concrete and also a better integral for the new slab. It should be applied over the whole surface that needs resurfacing. This is now the final stage. You must have followed all the above stages before this last stage now. The concrete is now mixed with the sand and the concrete is made stiffer and more so should be a bit drier than the common concrete. When this has been done, you will then float the mixture with a wood float. You will also need to tool it with an edger. The controlled joints are then cut. The surface is then left to cure for a week or so when it’s well covered with a plastic. The bonding process of a concrete to an old concrete slab will always be successful when the time-lines and the procedures are strictly followed. The bonding will be easily achieved and you will surely love the results! Try this guideline for a better bonding of your concrete slab! ← Can Solid Concrete Work Be Done In The Winter Time?